Team EG mystery announcement in 1 day 19 hours? Could a mod please edit the title when the official announcement comes out to make it relevant? The wait is finally over. After several days of hype and an I Love Bees style ARG, Evil Geniuses has revealed their big news. Evil Geniuses has acquired Chris "HuK" Loranger from Team Liquid. This highly controversial move was widely rumored to be the case, but EG isn't done there. In addition to this bombshell of an announcement, EG is also sending Greg "IdrA" Fields back to Korea. Both of these players and perhaps more will live in a brand new EG training house in Korea. Husky tricked into confirming EGHuK @1:50~ or is he trolling? It won't be sAviOr... he's been banned by GOM already, and any tournament that invites him, or even allows him to play, will be mobbed by anyone that followed BW, especially the Koreans. "There iS no grief Which time does not lessen and soften." 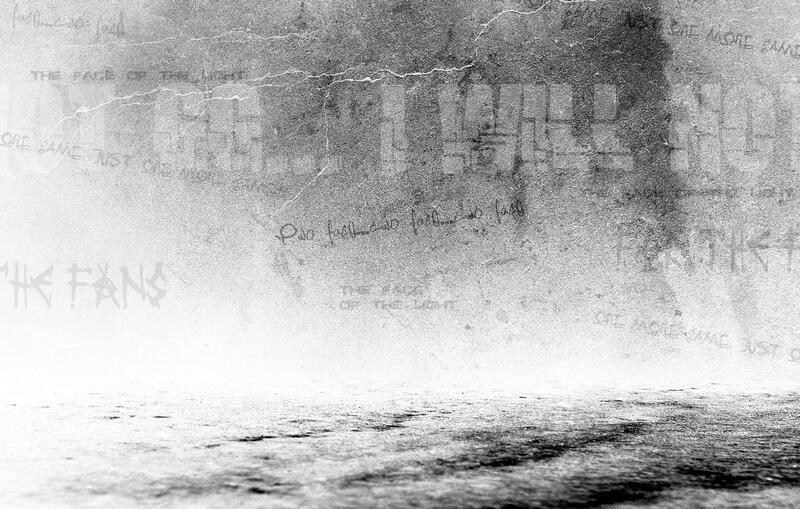 --- "The face of the Light"
--- "ONE more game, just ONE more game"
--- "Two face, two face, two face"
--- "I will not GG..."
* The First (of 5) MP3 has been revealed on the site. It contains recordings of two matches, commentated by various community figures, in between the sounds of waves (=liquid?) crashing. --- Game 1 iS HuK vs HasuObs from TSL3. --- Game 2 iS HuK vs qxc from Day9 Daily #262. --- Upon searching for this Author on Facebook, his location was revealed as Egypt. --- The source has since been edited to display, "@author keep lookin..."
* As the countdown iS based on the time of your computer clock, you can force all of the "Play" buttons to display by winding your clock forward. This accomplishes nothing though, as the MP3's have not yet been uploaded. 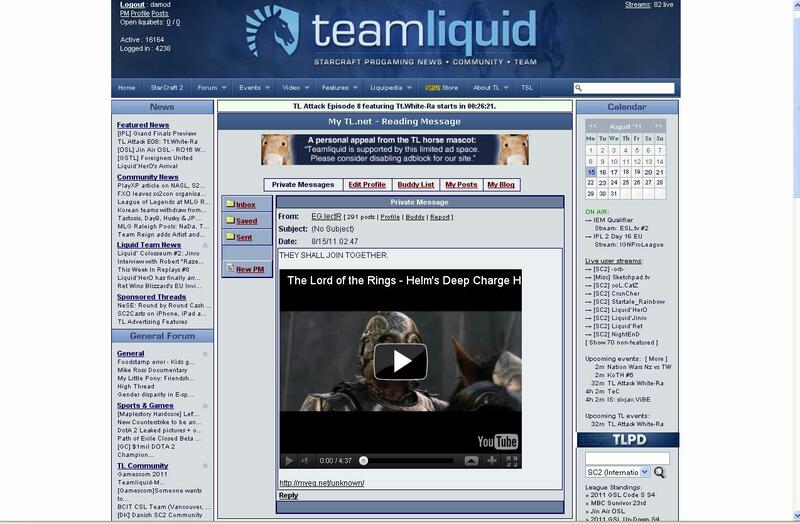 * EG.LectR PM'd several TeamLiquid members with links to various YouTube links, accompanied with the messages, "THEY SHALL JOIN TOGETHER." and "THEY SHALL Never FORGET.#@))))))))))))))))))))))))))))))))))))))))." --- ONE was a Lord of the Rings scene, where Gandalf the White commands reinforcements from the East. --- Another was a Johnny Cash SonG: Folsom Prison Blues. * EG.LectR bumped the fan-club threads for every single member of Team EG. He has since been banned. 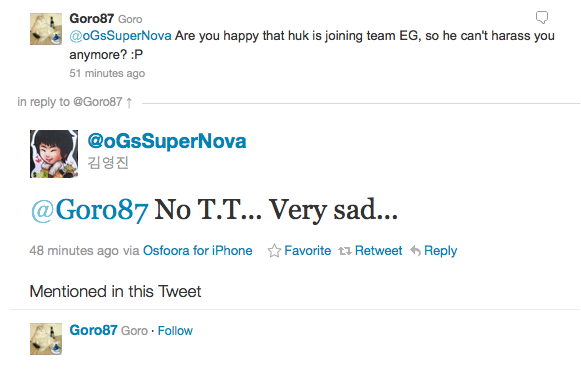 * When Heosat was asked to confirm/deny whether or not HuK was joining EG, he SaiD he was not at Liberty to comment. He removed this post soon after. * Several key community figures WhO know What the announcement iS, have suggested that there will be some form of community backlash. --- Kennigit: "Some massive drama iS going to go down in about a week Which people have known for months." --- FXO.BoSs: "A New Protoss player iS my guess.... Maybe HuK or SaSe." --- Mr Bitter: "As someone that knows What it iS, I can assure you all, this announcement may cause internet implosion." 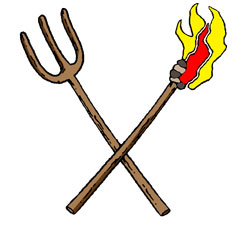 --- Heosat: Wwhat I can say iS this: it iS the First item of a chain of news items. Sadly not all the items are good news. " --- GenoZStriker: "Find the four horsemen and you'll perhaps find your Answer." I think that pretty much sums up everything so far... it's hard to say Which elements are red herrings and Which are substance. My own personal speculation iS some kind of partnership / player trade between EG and Liquid. EDIT: Included the Johnny Cash SonG, thanks Andrew2658. Puma coming to the EG house to train for raleigh. This does not have to be SC2 related does it? It's getting old... Announce it already ! Might want to change that time. And if you pay attention to the "play" button it links it to a mp3 file that doesn't exist yet. So potentially the mp3's will be released when the day counter reaches zero, the hour counter reaches zero, minute to zero and second to zero. Which will probably state what is going on. Im here today to give you an announcement regarding an announcement about an announcement announced on EG's twitter. I'm announcing this to you all so that when the countdown announced on this website hits zero you will all cry like little school girls and announce the announcement to the forums. Keeping to the announcement of an announcement theme that EG uses to announce announcements and arbitrarily increase hype of announcements I make this announcement. I agree. No need to keep us guessing. the countdowns and announcements are actually getting used way too much. Like only do it when there's some shaking the community news going on. Who cares? There is an announcement made every other day. You'll find out about it fast enough through the regular channels of TL ect. Probably the announcement for the big announcement that Puma is coming to the EG training house. These countdowns are getting pretty old at this point. I personally would rather they just wait until they're ready to reveal and post it in the usual forums (reddit, tl, etc) like everyone else, rather than trying to hype up things that have rarely (though not never) lived up to expectations. Seems like an attempt to make a mountain out of a molehill, hopefully I'm left eating my words. The countdown is based on your local computer time. So by fastforwarding your time you can trick the site into thinking the time is up. However it does nothing but remove the counter completely. are not yet available either way.